FREE GEEK Michiana, Inc. - "Helping the Needy Get Nerdy"
The IBM NetVista 2800 series thin client, Model 8364-TUS, is designed to boot GNU/Linux and other operating systems over a token ring network. FREE GEEK Michiana (FGM) was offered a skid full of these workstations if we could either reuse or properly recycle them. We decided to try reuse first. The NetVista 2800 Model 8364-EUS is desirable because the CPU is an Intel Pentium MMX, an Ethernet card is built-in and the other components are also GNU/Linux compatible. The Model 8364-TUS is less desirable because it has an onboard token ring network interface. But the Model 8364-TUS can be converted to Ethernet and used as an LTSP workstation with a little know how and not too much expense. 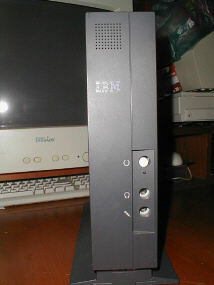 The NetVista 8364-TUS is the size of a large GNU/Linux reference book or the telephone book for a medium size U.S. city: front view, side view. What size and kind of compact flash? 4MB is the minimum compact flash (CF) you want. The CF only needs to hold the bootrom image. The images can be contained on a single floppy so 2MB may really be all you need. Search the IBM support web site for compatible CF cards (see References below). We used a PNY 32MB because it was the smallest CF we could quickly get our hands on, and it was on IBM's compatibility list. 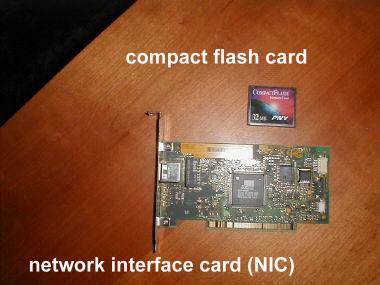 The NetVista BIOS appears to support up to 128MB CF cards. As far as we know any USB compact flash (CF) reader/writer should work. Some authors advise using reader/writers with only one CF slot so there is no confusion. We used a USB 7-in-1 device with 4 slots without any problem. Your mileage may vary. There are many ways to copy LTSP bootrom images on to the CF. We had LTSP floppy boot disks in our lab which we share with a church day care facility. During the day the kids boot Windows to play games. At night and on weekends the geeks net boot LTSP on the same machines with floppies. The LTSP bootrom images are stored on LTSP v3 servers in /tftpboot/lts/boot/bootroms. Copy the file matching your network card using dd. Our example uses a 3c905 NIC. Replace "3c905c-tpo.lzdsk" with the image for your NIC. Don't mount /dev/fd0 first -- dd will see the device is in use and refuse to access the disk. Use any GNU/Linux distro with USB support to flash the image. Mike picked Damn Small Linux (a Knoppix derivative) and booted it on one of the Windows boxes in the lab. The USB reader/writer is /dev/sda. Do not use /dev/sda0 or /dev/sda1. The "0" and "1" denote partitions. The reader/writer will write to the partitions. We want to write to the raw device. Do not mount /dev/sda prior to issuing the dd command. dd doesn't work on a mounted device. 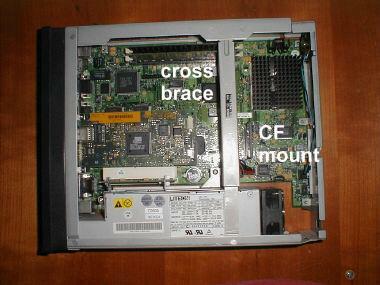 The CF mount is almost beneath the chassis cross brace in the front third of the motherboard and close to the IDE connector. The CF only mounts one way. Be gentle. No hammers in your tool kit, please. If you need a hammer, you have the CF in backward. Make certain you have an IBM compatible CF. We used a PNY 32MB. The BIOS appears to support 128MB cards. The minimum size for the project is 2-4MB. LTSP works best with PCI expansion cards. 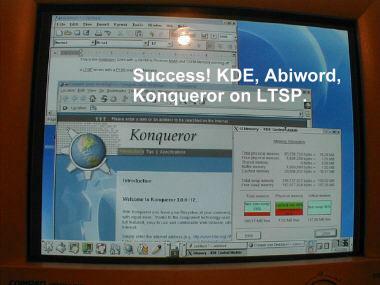 LTSP will automatically probe workstations and create workstation hardware profiles on the fly. 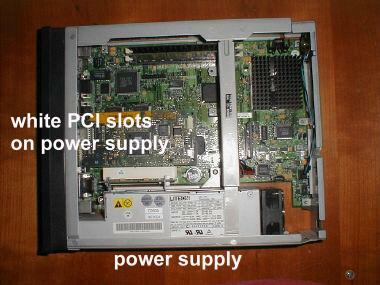 The NetVista 2800 has two PCI slots. We chose to install an industry standard, Linux compatible 3Com 3C905c 10/100 PCI NIC and find a way to disable the token ring boot routines. Remove the case. Here's the trick -- look for a plastic latch below the power switch and power cable connector on the rear panel. Set the unit on its base. Hold the case with one hand. 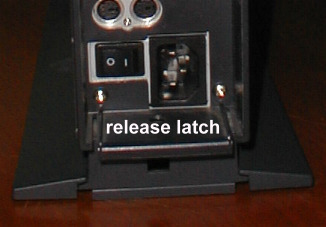 With the other hand lift the latch upward and at the same time pull the latch away from the case. The chassis should slide out with almost no resistance. Good old IBM engineering. Loosen the large thumb screw above the expansion port covers on the rear of the chassis. 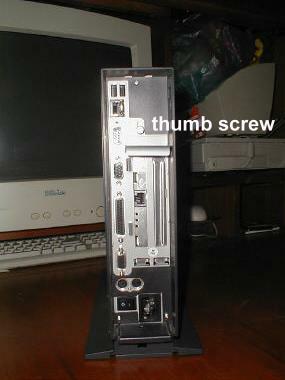 Don't remove the thumb screw. 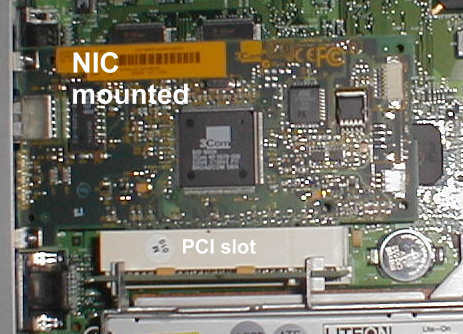 Remove the port covers and insert the NIC into one of the white PCI expansion slots mounted on the power supply. Place a port cover on the open port and tighten the thumb screw which locks the port cover and the NIC in place. 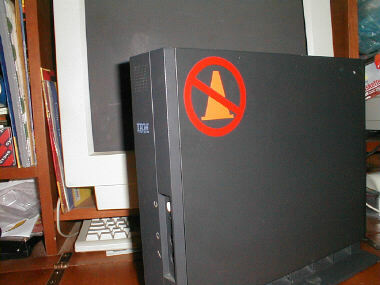 Depending on the history of your NetVista you may not be able to enter the BIOS. There are two methods to reset the BIOS and gain entry. We'll give you the easiest method. Move the chassis around so that you are facing the front with the fan on your left. Locate the on/off switch on the front panel. The switch should have a white plastic barrel covering its shaft. 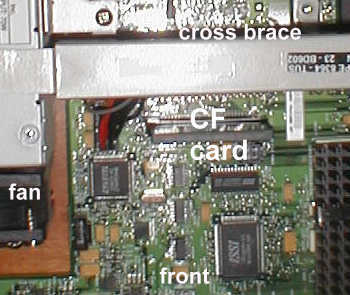 The switch itself is mounted on the motherboard. Just to the right of the switch are a pair of jumper blocks. 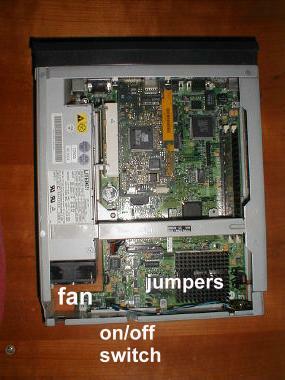 The jumper block closest to the front of the chassis is labeled PASSWORD OVR. Move the jumper to the left one pin so that it covers the leftmost pair of pins and the far right pin is exposed. Start the unit. Count to twenty (20), and turn the system off. Move the jumper back to its original position covering the rightmost pair of pins and exposing the leftmost pin. Wait at least 20 seconds and restart the system. Wait for the token ring boot routine to time (error) out. If you do nothing, the system should enter the on its own. Choose "continue" until you get to the Configuration/Setup Utility. Accept all defaults except the following. Save settings. Exit setup. Reboot. The moment of truth. Connect the NetVista's newly installed Ethernet card to your LTSP client/server network. Make sure your net boot process proceeds as planned. The NetVista may boot faster if you create and tweak a LTSP workstation hardware profile for it instead of relying on the server to auto probe. There may be other issues which alter boot time -- we don't know. Insufficient system memory. 32MB is the recommended minimum system memory for a LTSP workstation if you want to run X Windows, 64-128MB if you enable local apps. Password protection. There is no telling where your NetVista 8364TUS came from. Password protection may be enabled. Good luck on guessing the password. You may want to know how to wipe the password. The password over-ride jumper is near the front of the chassis next to the front panel power switch. It is labeled PASSWORD OVR or something like that. Know that the password over-ride will also reset the BIOS to the default settings. 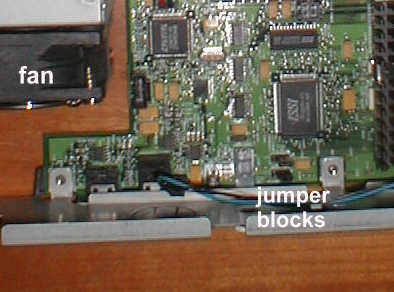 The jumper block is three pins wide. Move the jumper to the left set of two pins. Boot up. Shut down. Move the jumper back to the original position. Incompatible compact flash. Be sure to check the IBM web site for compatible compact flash cards. Any Sandisk or Toshiba compatible less than 128MB should work. But check anyway. No sense wasting time or money. Common sense. Use only known good cables and ports. Test the network card and other components before converting your NetVista workstation from token ring to Ethernet.